I’m not usually a fan of using box cake mixes; at least not for their intended purpose. 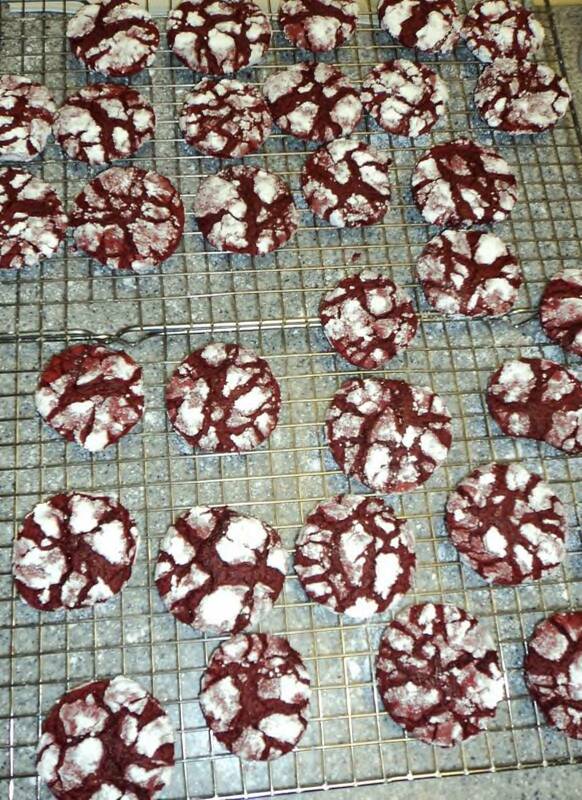 Here is a recipe for Red Velvet Crinkle cookies that start with a box of Red Velvet Cake mix. Preheat oven to 375 degrees. Cover two baking sheets with parchment paper, set aside. In the bowl of a stand mixer, beat together the melted butter, cake mix, eggs & vanilla until fluffy & smooth. In a shallow bowl, sift together 1/2 cup powdered sugar & 1/2 tsp. corn starch. Roll cookie dough into 1 inch balls and then roll in the powdered sugar mixture. (If you run out of powdered sugar, sift together an additional 1/2 cup powdered sugar & 1/2 tsp. corn starch). Place cookie dough balls on the prepared baking sheets, space them about 2 to 3 inches apart as the cookies spread out quite a bit. Bake for 9 minutes exactly. The cookies will not look done, but they will set up more as they cool. Remove from oven and allow to cool on the cookie sheets for 1 minute and then place cookies on a cookie sheet to cool completely. Store in an airtight container.